MIM boasts a huge amount of volume for a yacht of her size and is in beautiful condition, having undergone a major refit in 2016. 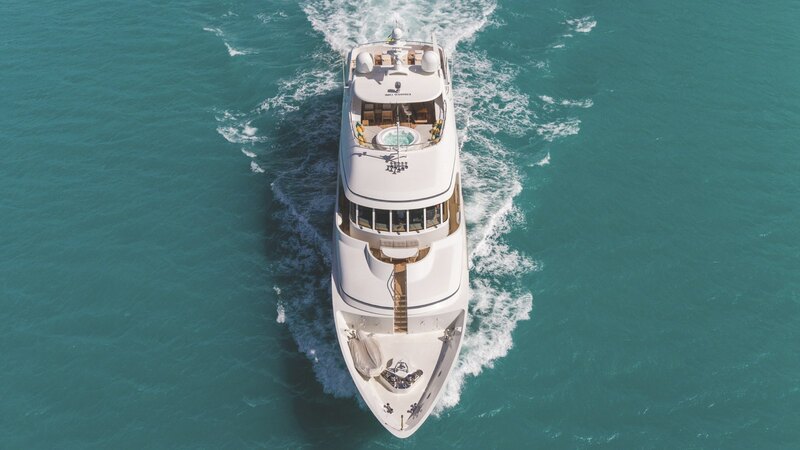 One of MIM’s best features is her unique accommodation set up, with 7 ensuite staterooms for up to 12 guests, making her perfect for larger groups. Her cabins include the master suite, located in prime position on the main deck, a VIP on the skydeck, with three doubles and two twins below. The main salon is a large, welcoming space, entered through striking double glass doors, with L-shaped lounge seating and arm chairs, an entertainment system and a full formal dining table for all guests. Another stand out feature is the balcony that leads of the saloon on the main deck; glass doors open to a drop down balcony which offers stunning views and is a memorable spot to enjoy a beverage or admire your surroundings. The main salon leads out to the aft deck with another dining table and bench seating, perfect for a relaxed meal or dinner under the stars. Families, groups and couples alike will love MIM for her huge amounts of space, timeless styling and water set up. She is sure to delight! Learn How to Rent a Luxury Yacht today! On entering through circular double glass doors into the grand salon you can’t help but notice the almost full height picture windows which allow in bundles of natural light. The salon offers various seating options with elegant couches and chairs with a large coffee table. To starboard, a pair of glass doors opens out to a drop down balcony that hovers above the sea. Forward of the salon is a large expandable formal dining table with seating for up to 12 guests. Located forward of the dining area is the main lobby which houses the yacht’s impressive 40” (1m) diameter, pneumatic glass elevator surrounded by a circular sculpted bronze and glass stairway with illuminated glass threads spanning all three interior stories. The beautiful glass spiral staircase leads down to 5 guest staterooms and up to the impressive skylounge, bridge and VIP stateroom. One of the most multifaceted areas on the yacht is the skylounge. It serves as a spiritual respite, an area for casual entertaining or a home theater setting equipped with a 120″ (3m) retractable theater screen. The skylounge also features a 63” LG TV with integrated full-feature CD/DVD. Large windows to port and starboard allow in generous amounts of daylight and panoramic views from the upper deck. Double doors lead out to a large covered dining deck with retractable roof for sun or shade. 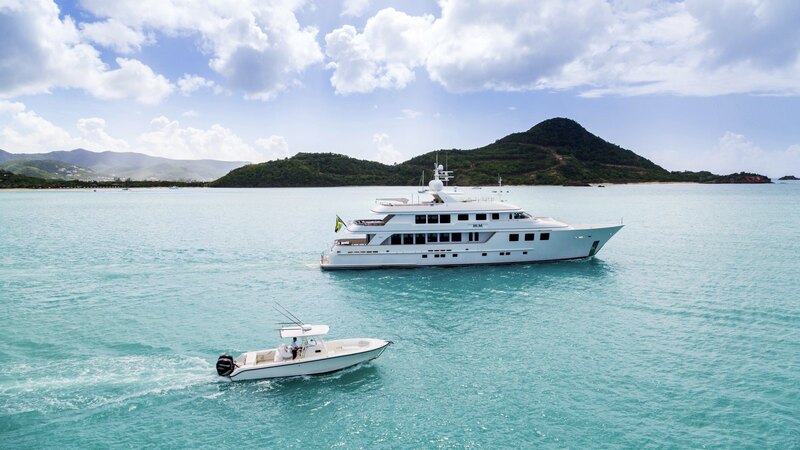 This versatile yacht offers a variety of al fresco dining options including the lovely open aft deck which offers bench seating, teak table, dining chairs and settee for 10 guests and upper aft deck dining which hosts a large round table seating up to 12 guests. 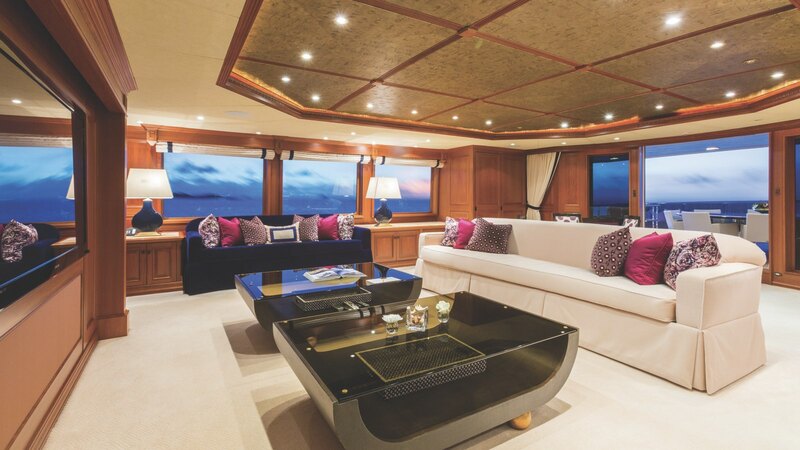 Additional guests are easily accommodated by the settee to the port side and lounge seating surrounding the perimeter. MIM offers the ultimate in guest accommodations which include a full beam on-deck Master suite, a VIP stateroom with queen berth on the Skylounge level, and five generous guest staterooms below deck: three with queen size berths and two with twin berths; (one of the twin rooms can be converted to form a king berth). MIM boasts a myriad of water toys and tenders for adults and children of all ages. MIM is host to an abundance of unique features such as an interior elevator, zero speed stabilizers, and 7 staterooms along with over 400 gross tons of interior volume. Last but not least, the sun deck is easily the most enjoyed deck on the entire vessel. Vast amounts of deck space make this one of the most popular areas guests to congregate. This enormous deck features a spacious Jacuzzi surrounded by comfortable sun pads. A custom built bar with 5 white leather stools is the focal point of this sprawling space. The teak furniture can be rearranged easily for multifaceted use. While in port or at anchor the aft section is the perfect spot to catch some sun while lounging on the 4 available chaise lounges. Gas grill, refrigerator, ice maker, and sink are also featured on this deck. Water sport lovers will marvel at MIM’s impressive lineup of toys and tenders with enough different equipment for every single guest to be doing a different water activity at the same time! These include a 37’ 2017 Marlago tender, a 23’ inflatable Joker tender, jetskis, SeaBobs, paddleboards, kayaks, scuba gear, surf boards, and a water slide. MIM cruises at a comfortable 13 knots, powered by twin MTU engines and with zero speed stabilizers to ensure high comfort levels. Suspended above the water line, a balcony off of the starboard side of the main salon creates an al fresco atmosphere for relaxing on the open ocean. 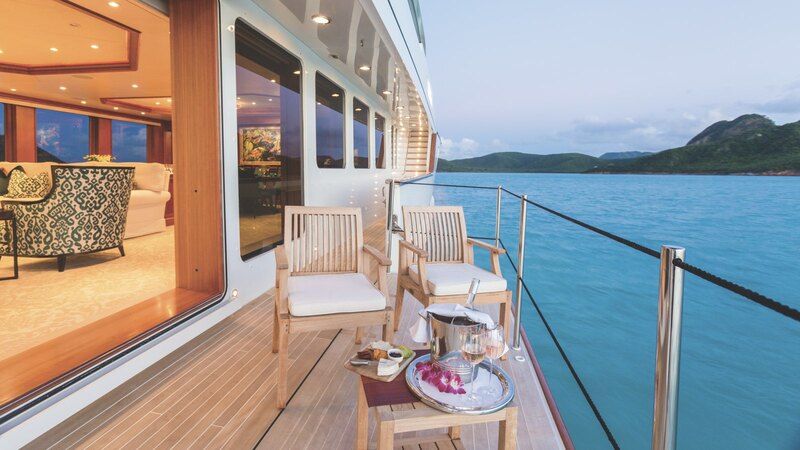 One of the most multifaceted areas on the yacht is the skylounge. It serves as a spiritual respite, an area for casual entertaining or a home theater.